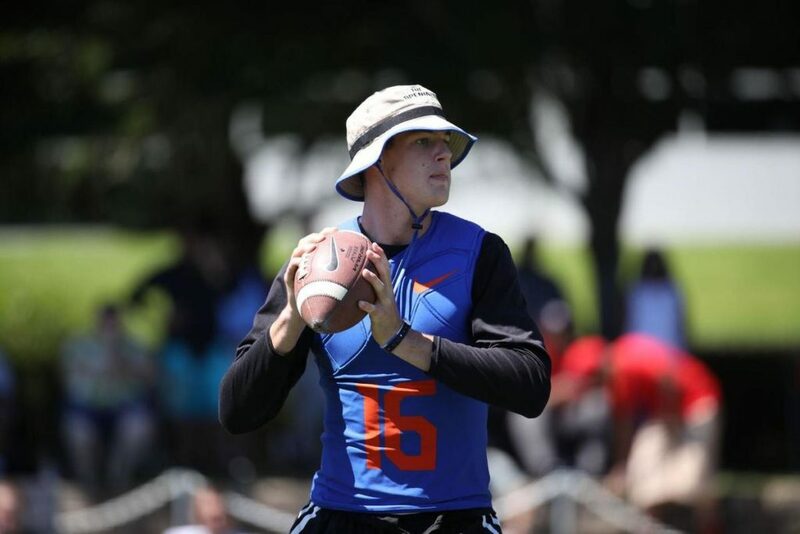 One of the nation’s top high school quarterbacks made summer headlines when he declined to participate on Sunday at two of the most prestigious displays of prep talent at national events. Tanner McKee, a 6-foot-6, 220-pound senior-to-be at Centennial High in Corona, California, said the influence, example and teachings of his parents led to his honoring Sunday as a day of rest. McKee is a member of the LDS faith and plans to go on a two-year mission when he finishes high school in 2018. He is the highest-ranked quarterback recruit in that class that remains uncommitted as to where he will sign to play college football. “It’s a decision I made before, that when I had control over the situation, I would not play on Sundays. For now, I do have control and the choice,” McKee said Thursday, a few days after his 7-on-7 team made the finals of “The Opening,” an event held Monday at Nike’s world headquarters in Oregon. The week before, at the prestigious Elite 11 quarterback competition, McKee did not participate in Sunday’s competition. “At first some of my teammates were disappointed that I wouldn’t play, but they respected it, they were OK with it,” said McKee. Rated the No. 3 dropback quarterback in the country, McKee has offers from a number of schools, including Alabama, Texas, Washington, UCLA and BYU. He spent part of his summer making unofficial visits to Alabama, Auburn, Duke and Texas A&M. “I think it’s awesome that Tanner made this decision,” said QB Elite 11 director Dustin Smith, who knows McKee and frequently trades text messages with the California prep star. On Saturday, McKee will lead his 7-on-7 team to compete in the Battle at the Beach, where 20 teams will assemble in Huntington Beach, California, in four pools of five teams. At Monday’s Opening, McKee threw 12 touchdown passes in three tournament games with no interceptions. On Sunday, he sat out pool play. McKee’s competitions have given him an opportunity to develop a close friendship with Utah quarterback commit Jack Tuttle, who was also at The Opening in Oregon and the Elite 11 event. McKee was impressed with Tuttle’s play, his arm, his reads and his decisions. McKee himself said he is confident in his own abilities, his arm strength, and accuracy. Said Smith, “Tanner has all the tools to be a very, very good college quarterback. But what is most impressive to me is using his position and with confidence, taking this decision on Sunday play and not backing down. This past year at Centennial, McKee threw for 3,522 yards, 36 touchdowns (only eight interceptions) and a 72.5 completion rate for a team that finished 11-2. McKee’s decision on Sunday play isn’t something he makes a public issue of but he has explained it when asked by camp directors, reporters and recruiting Internet sites. While it’s not a decision exclusive to him, it is rare at these affairs. Both the Elite 11 and The Opening are invitation-only events, once-in-a-lifetime opportunities for a kid in his position. For McKee, it was simple. He made the decision a long time before he got to the Sunday in question if it was in his control and not part of a contract, he’d rest on that day. Everything else would take care of itself. KSL Sports – What makes a great quarterback?